Mark's Tickets is the best place to find tickets for Maroon 5 fans. Just check this page for any new events or schedule updates throughout the year. We sell tickets to every Maroon 5 concert around the world. We know how passionate Maroon 5 fans can be about pop & rock music, so we make sure to have hundreds of tickets for every concert available right up until showtime. For those looking for cheap Maroon 5 tickets, we offer tickets starting at very low prices (many times below face value). We offer tickets in most sections of every venue that Maroon 5 performs. Simply choose the city or venue that you are interested in below, and you will be able to see all of the available seats. Do not forget that Marks Tickets also specializes in sold out Maroon 5 tickets. No longer will sold out shows prevent you from seeing Maroon 5. Maroon 5 is an American pop rock band that originated in Los Angeles, California. The group formed in 1994 as Kara's Flowers while its members were still in high school. With a line-up of Adam Levine, Jesse Carmichael, Mickey Madden and Ryan Dusick, they signed to Reprise Records and released an album, The Fourth World, in 1997. After a tepid response to the album, the band parted ways with its record label, and its members attended college. 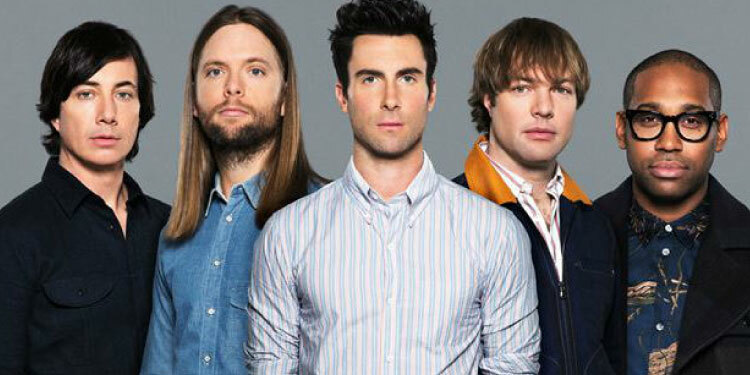 In 2001, the band regrouped, adding James Valentine to the lineup, and pursued a new direction under the name Maroon 5. Maroon 5 signed with Octone Records and released their debut under the title Songs About Jane in June 2002. The album's lead single - "Harder to Breathe" - received heavy airplay, which helped the album to debut at number six on the US Billboard 200 chart. The album's second and third singles, "This Love" and "She Will Be Loved", became worldwide hits reaching the Top Five on the US Billboard Hot 100 chart. The band won the Grammy Award for Best New Artist in 2005. For the next few years, the band toured extensively worldwide in support of Songs About Jane and produced two live recordings: 2004's 1.22.03.Acoustic and 2005's Live – Friday the 13th. In 2006, drummer, percussionist and backing vocalist Ryan Dusick left the band and was replaced by Matt Flynn. The band recorded their second album It Won't Be Soon Before Long in early 2007 and released it a few months later. The album reached number one on the US Billboard 200 chart, and its lead single, "Makes Me Wonder", became the band's first number-one song on the US Billboard Hot 100. Hands All Over, the band's third studio album, was released in September 2010 and peaked at number two on the Billboard 200 chart. In 2011, the album was reissued and supported by their single "Moves like Jagger" which features American singer Christina Aguilera. The song became the band's second single to reach number one on the Hot 100 chart; it has sold over 8.5 million copies worldwide, making it one of the best-selling singles worldwide. Maroon 5 released their fourth studio album Overexposed in June 2012. The album peaked at number two on the Billboard 200 chart. Its first two singles, "Payphone" and "One More Night", were both international hits and peaked at two and one on the Hot 100 chart respectively. Since its debut in 2002, the band has sold more than 10 million albums and more than 15 million digital singles in the United States, and more than 27 million albums worldwide.